A lot of times in playoff games there are big plays, momentum changes, things that really stick out that turned the tide of the game. But for Grain Valley Friday night, there was no big play that really stood out, nothing you could point your finger to that helped them to a 32-6 first-round win over Warrensburg. This was just a dominating effort on both sides of the ball, a take-care-of-business kind of game. The Eagles took control of the game in the first half, striking midway through the first quarter on a 22-yard touchdown pass from Kellen Holland to Devontez Morton to make it 7-0. Early in the second quarter it was the defense setting up the offense, as Triston Hillyard intercepted a pass deep in Tiger territory, returning the ball to the Warrensbug 22. Five plays later, Zack Ehlen found the end zone from 4 yards out to make it 13-0 after the two-point conversion failed. The big play on the drive was a fourth-and-4 conversion when Holland found Trevor Henson for 10 yards. Then, with just two minutes, two seconds left in the first half, the Eagles dealt the Tigers a crushing blow, driving 76 yards in 13 plays and capping the drive with a 13-yard touchdown pass from Holland to Evan Velasquez with just 7 seconds left before halftime. After another failed two-point conversion it was 19-0 at the break. Holland put together one on of his most complete games of the season, completing 15 of 30 passes for 252 yards and three touchdowns. What Allie saw on film was no surprise to Tiger head coach Scott Grinde. The Tigers didn’t have an answer for the Eagle defense, either. A team that leans heavily toward the run was never able to string anything together against a stingy Grain Valley squad that frequently left the Tigers in third-and-long situations. “We knew they were going to try and get to the edge and try that fullback trap,” linebacker Brenton Leighow said. “We shut down the edge and that helped us out a lot. We were able to keep them in middle and that helped us corral them. 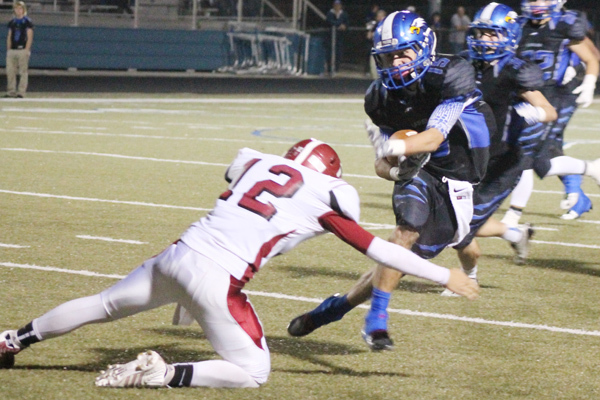 Grain Valley was able to stack the box thanks to an anemic passing game from the Tigers, as they finished 0-for-10. “We’re not a big-play type of offense,” Grinde said. “We like to pound it, ground it out. They had our number in that respect. We got behind and it was tough. When you’re in third-and-8 all the time that’s tough to deal with. Meanwhile, the Eagles passing game remained on point, as they put the nail in the coffin on the first play of the fourth quarter when Holland found Morton again, this time from 25 yards out for another score to make it 25-0. Both teams added another touchdown to finish the scoring, with the Grain Valley getting theirs on defense when Hillyard ran in a Warrensburg fumble from 10 yards out. Warrensburg wrapped up its season 3-7, a big improvement from back-to-back winless seasons. Meanwhile, Grain Valley (5-5) will face Harrisonville for the second time this season next Friday night. They’ll look to avenge a 23-9 defeat.